A convenient ebook purchasing experience is marred by a lack of mobile apps. But everything else works just fine. As part of the blitz of new features in the Windows 10 Creators Update (see our full review here), Microsoft has added e-reading capabilities to its Edge browser. It’s a bit quirky, given its infancy, but with a bit of practice you can be lounging by the pool with an electronic novel in no time. The first question you’ll ask: Does it surpass Amazon's Kindle app. Well, sort of: The Kindle app available for Windows tablets rejected my (correct) Amazon password, a bug that numerous other users have reported. (The Kindle for PC app buried within Amazon’s site works, however). Edge offers pretty much what you want from an e-reader app anyway: a progress bar, the ability to resume where you left off (mostly), and solid text-formatting options. Reading ebooks is also an opportunity to take full advantage of a detachable Surface tablet, as opposed to a traditional notebook PC. Microsoft’s Store now has a nice collection of ebooks to go along with its movies, music, apps, and more. 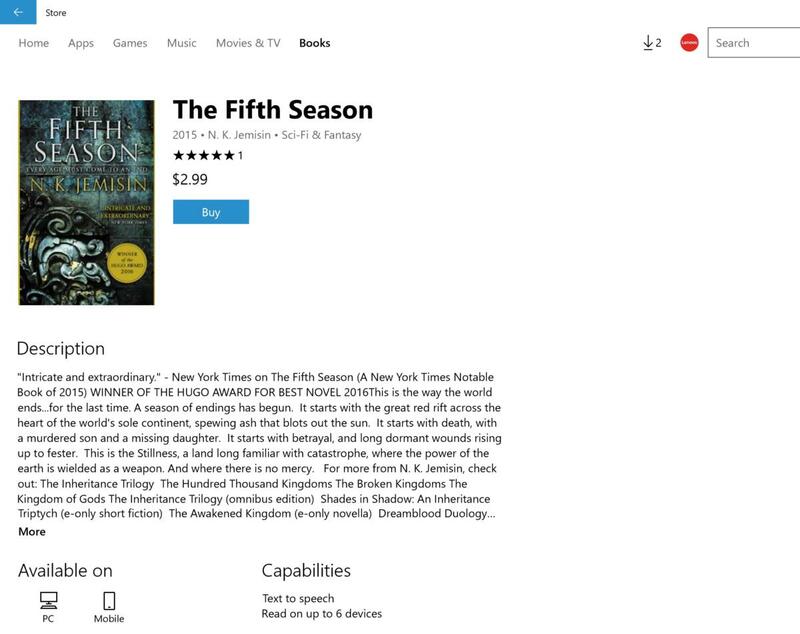 Windows’ ebook-buying process begins with Windows 10’s Store app, which as of the Creators Update adds an ebook store alongside its selection of apps, games, music, and movies. All told, the Store app has evolved into a respectable marketplace. Not surprisingly, the ebook store looks remarkably like the other categories: At the top of the screen are a few “hero” selections, a handy link to some free classics, and some links to “top” and “featured” books. How many books does Microsoft offer? “Hundreds of thousands,” according to a company representative, with plans to offer New York Times bestsellers as well as other top titles across a range of genres. Scroll down, and you’ll see the handiwork of Microsoft’s curators, with collections of different genres and other featured works. Though there’s a search box, you can’t do something as basic as search for “cookbooks.” That term appears in the genre-based collections at the bottom of the main page, however. As I was writing this in mid-March, Microsoft had not highlighted any sales or discounts, something the company will need to do if it truly wants to compete. My own poking around revealed some price differences between ebooks sold on Kindle vs. the Microsoft Store: Jim Edwards’ Rookie Cooking was $11.69 on Microsoft and $17.09 on Amazon; more popular ebooks like Neal Stephenson’s Seveneves, however, were priced comparably. Amazon competes notoriously hard on price, however, so it’s possible that any discrepancies simply escaped its notice. Disappointingly, some books, like the Harry Potter series, simply weren’t available in the Microsoft Store as of this writing. If you’re the type of person who reads a band’s biographical info in Groove Music, you’ll notice a similarity: massive blocks of summary text. Purchasing an ebook is easy-peasy. Once you’ve purchased an ebook, feel free to open it immediately. Otherwise, you’ll be off on a merry little hunt—where is my ebook library, again? Instead of tucking shortcuts to your library all over the place, you’ll need to return to the Store’s main “Books” homepage, and then click the My books link. Doing so will launch Edge. Unfortunately, Edge opened my “Reading List”—a collection of web pages I stored to read later—and not my collection of ebooks. Even in Edge, "Books" isn’t found intuitively; you’ll need to navigate to the Hub—the icon to the right of the “star” in the URL bar—then navigate to the icon that looks like a collection of books leaning against one another. Microsoft might not force you to open a separate app to read an ebook, but that doesn’t mean it’s any easier a process. The Microsoft Edge Hub, in which your ebooks are stored within the Books section. Within the Books sidebar, you’ll see your collection of books, with a progress bar showing how much you’ve read. At the bottom of the sidebar is a link back to the Store. Once an ebook is opened in Edge, navigating its contents is simple enough. Edge will open the book to the title page, possibly (depending upon how the book itself is organized) with a list of hyperlinked chapters. At the bottom of the screen you’ll see the title of the book, the chapter (if any) and your progress as a percentage of the book. 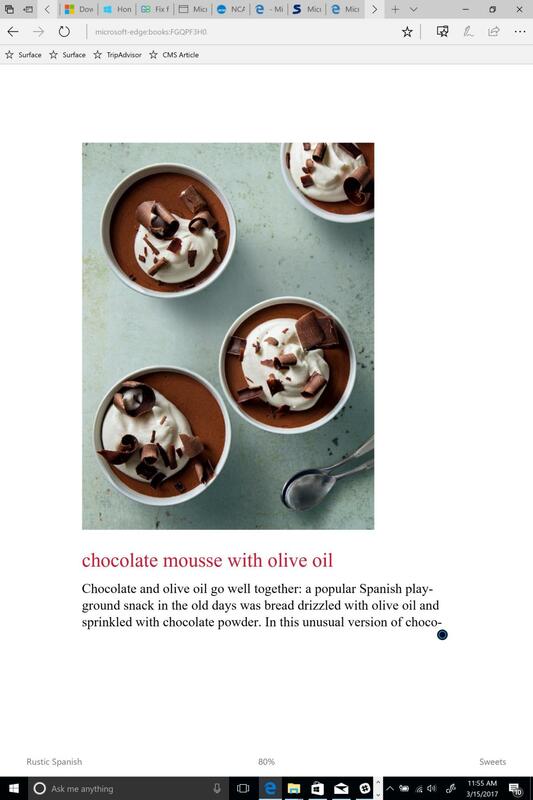 Lush, lavish cookbooks lose a little something in the EPUB format, though traditional text-heavy books look just fine. More options open up if you simply tap the screen, which reveals a black border at the top of the page. At the upper left there's an icon that displays the table of contents, which slides out from the left. Click the icon next to that and any bookmarks you’ve saved will appear. Edge also includes a search function to look for specific terms. In the right-hand corner, the Options icon (alternatively Ctrl + Shift + O) lets you adjust text font, size, color, and spacing. There's also an icon to “read aloud” via text-to-speech, which also lets you adjust pacing, evidence of Microsoft's commitment to assisting those with vision problems (although there doesn't seem to be a hands-free Cortana command to "read my ebook"—hopefully that's forthcoming). There's also an icon to set bookmarks within your ebook, one per page. Unfortunately, features you might expect in an e-reader app, and which are available elsewhere in Windows—inking, highlighting, sticky notes, titled bookmarks—haven’t yet made it to Edge’s e-reading experience. There aren’t many options within Edge’s Books e-reader, but you don’t need many, either. 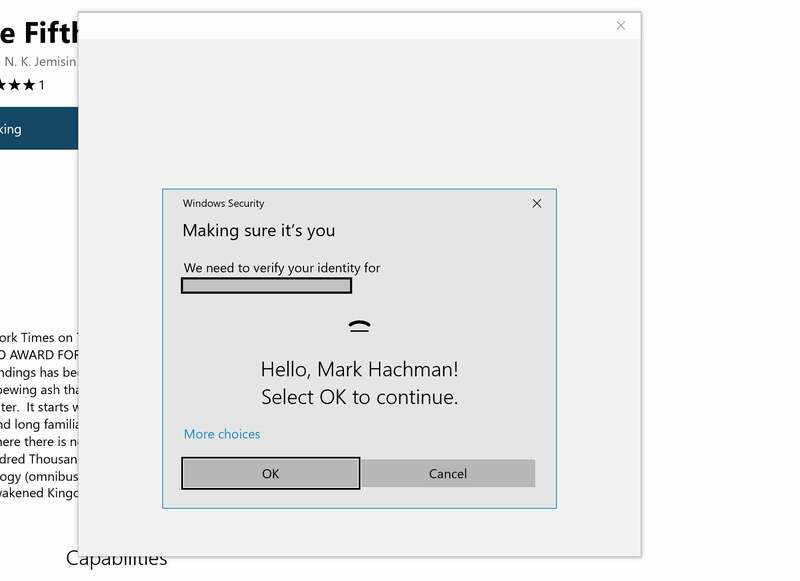 If you stop reading an ebook—say, because Windows 10 unexpectedly reboots your PC—your progress will be saved. That's how it's supposed to work, anyway. As I was evaluating Edge using a build of the Windows 10 Creators Update that Microsoft provided to journalists, the OS updated to a new build—forcing me to redownload all of my books, and losing my progress. That needs to be fixed. Unfortunately, Microsoft’s mobile ebook experience is limited to the small number of Windows phones in existence, as Microsoft doesn’t make a version of Edge for Android or iOS. That’s a serious and unfortunate handicap for train or bus commuters. Since Microsoft does include a browser inside its Bing app for both mobile platforms, it’s at least theoretically possible that this capability could be added later. How successful will Microsoft’s ebooks gambit be? 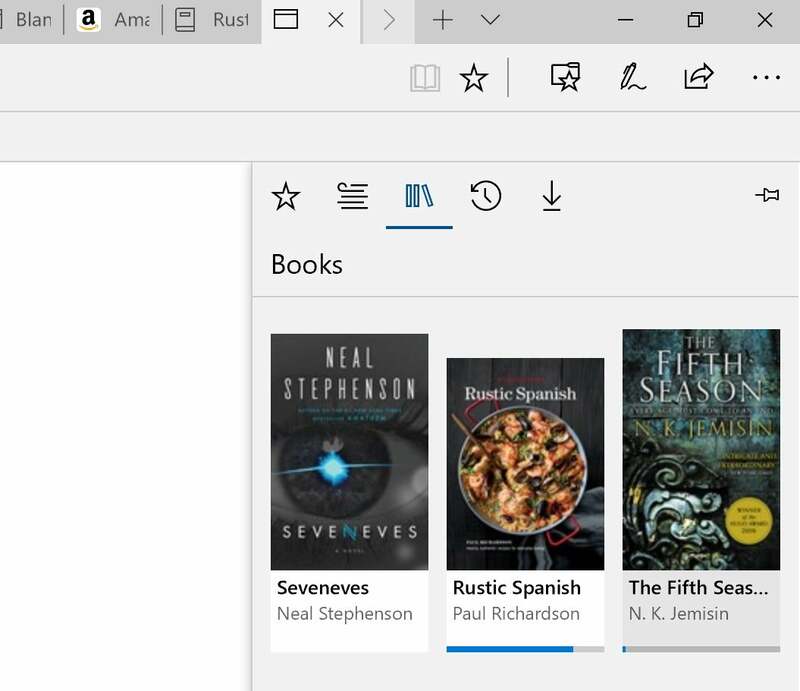 Microsoft’s real advantage is that its Store app is just a click away in your Windows 10 Start menu, versus opening a browser to hunt down a similar book on Amazon. What's more, Amazon doesn’t sell books in EPUB but rather than in its own proprietary Kindle format, which requires the dedicated (and for now, buggy) Windows app. Truer competition comes from sites like eBooks.com, which includes EPUB among its formats. For now, you’ve probably already settled on an ebook format and reader. 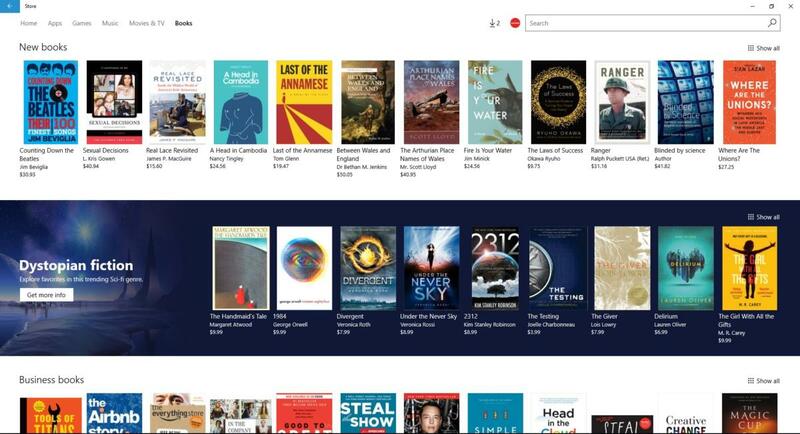 If Microsoft launches its ebook store with a splashy sale, however, you could be lured in. And aside from the obvious mobile limitations, reading ebooks within Edge isn’t half bad.